Addition, already? I know 🙂 I purchased Lancome Bright Expert to take care of hyper pigmented acne scars on my face. It’s claim – Faster dark spot reduction in just 4 weeks. And I am taking note. I will update in 4 weeks. I purchased them at Macy’s and the gift with purchase includes black cosmetic bag, mini Visionnaire, mini Genefique, mini Refill 3X moisturizer, Juicy Tubes in Moulin Rose, Cils Booster XL & mini Hypnose Doll Lashes mascara. 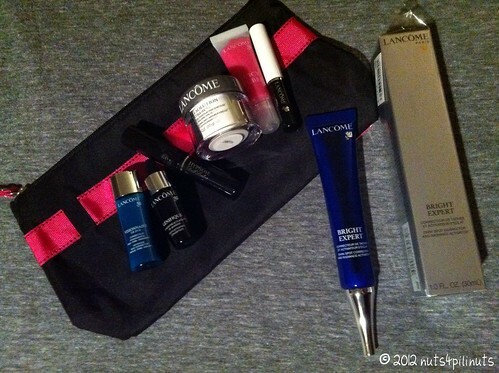 Available online and in-stores everywhere Lancome is sold, $65.